Put into bat, Sri Lanka were allout for 236 but they still managed to put pressure on Pakistan, who were left toterring at 162-7 at one stage. The prize for Monday's winners will be a semi-final spot, nearly certainly against England on Wednesday at the same venue rather than facing Bangladesh at Edgbaston 24 hours later. However, Sarfraz will be on notice for the semi-final and if Pakistan exceed their allotted time period in that match and win, he could be suspended for the tournament decider. Junaid swiftly added the wicket of Thisara Perera (1) with a fuller ball swinging away that took the thick outside edge of the batsman's expansive drive through to slip. Sri Lanka will face Pakistan in the final game of the group stage in Cardiff on Monday with the victor progressing to the semi-final to take on England. Chasing 237 for a triumph, fast bowler Mohammad Amir (28 not out) showed great resolve to stitch together an unbeaten 75-run stand with Sarfraz for the eighth wicket to help his side register the win in a see-saw battle. Sri Lanka reacted well to the early setback, with Kusal Mendis - so impressive in striking 89 in the shock win over India on Thursday - quickly into the groove, driving nicely through the covers. Things looked settled for the Island nation before Hasan Ali came up with a fiery spell, in which he troubled Mendis with pace and bounce before eventually bowling him out. The start of the Pakistan run-chase belied their later struggles, as Fakhar fired eight fours and a six in his blistering half-century, while Azhar Ali (34) also made the most of a fifth-ball reprieve, when dropped by Gunathilaka at point. 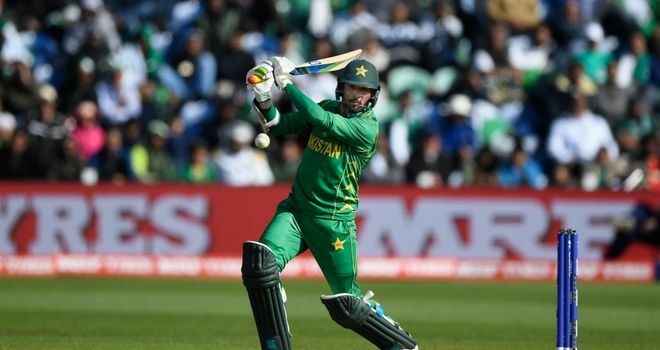 Shoaib Malik (11) and Imad Wasim (4) also coudn't last long and perished in consecutive overs as Pakistan slumped to 137 for six in 25.4 overs. Bad news for Sri Lanka is that Kusal Perera will be out of action. Junaid sent back new man Dhananjaya de Silva (1) and Amir returned to dismiss Dickwella, who fell to a sensational low catch by wicketkeeper Sarfraz Ahmed.